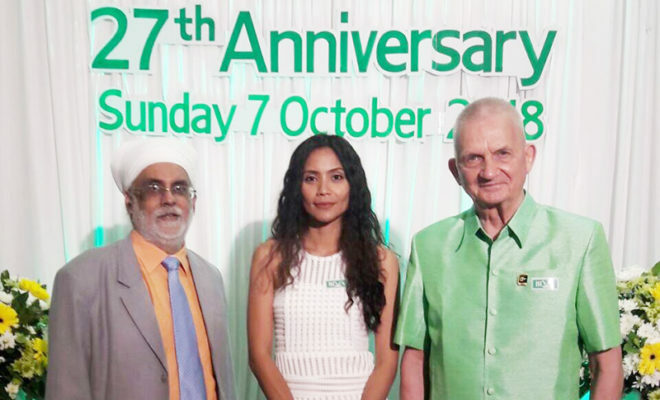 At pool terrace of Holiday Inn Hotel, more than 100 guests met on the occasion of 10th anniversary of foundation of Rotary Club Phoenix Pattaya to properly celebrate the event. Yet the spectacular sunset caused many visitors sigh “ah” or “oh”. After all guests had taken their seats, the evening has been opened. Ceremonial master Peter Malhotra once more professionally and with a lot of charm hosted the evening. It was also him who helped the Club in its beginnings very much. Attendees were particularly happy about the moving speech by founding president Stephan Heynert on stage, talking about past years of “his” Club. 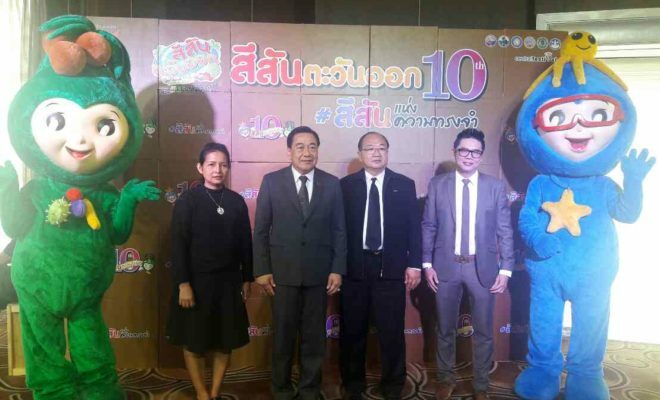 Other spokesmen were president Peter Schlegel and District Governor Onanong Siripornmanat. 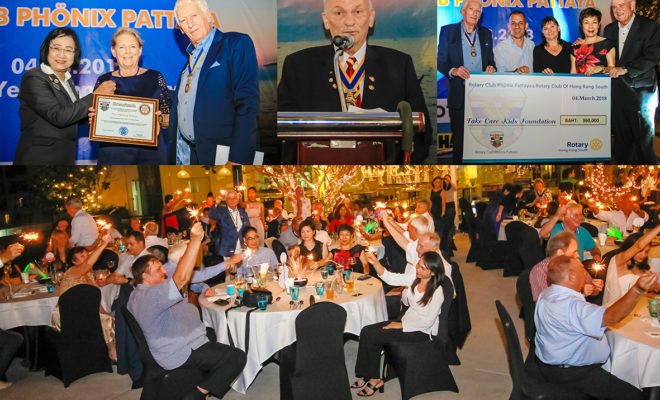 Hubert Meier came for the first time as representative of Rotary Club Hong Kong South and Rosita Le Meier was present for Lions Club Hong Kong. 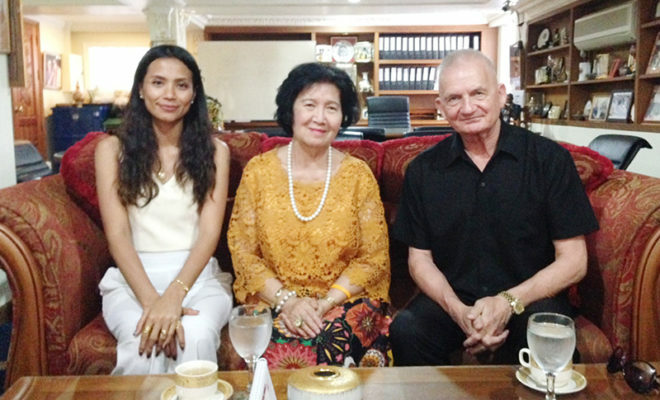 Ingeborg Schlag has been appointed to be an honorary member as of her commitment for Take Care Kids Foundation, and Juergen Lusuardi received a symbolic cheque with an amount of 360,000 THB for the foundation. This amount has been provided by RCPP and Rotary Club of Hong Kong South. 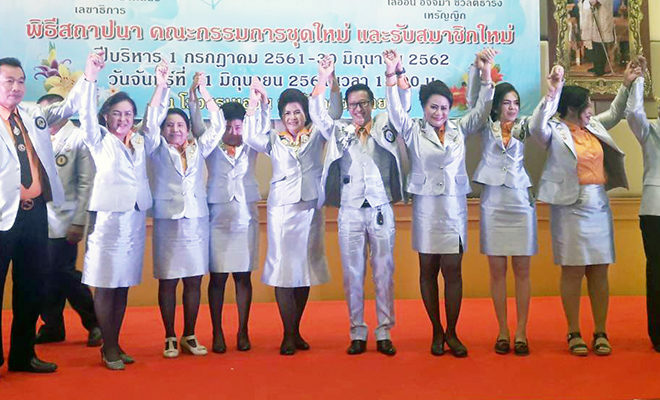 Members of RCPP were exceptionally happy that the other clubs appeared in large numbers and therefore would especially thank clubs Eastern Seabord, RC DACH Bangkok, E-Club of Dolphin Pattaya, RC Bangkok South, RC Bangkok Bangkapi, RC Pattaya Marina and RC of Chonburi. All those have been represented by their presidents or members. Not to forget Dr. Seur who also wanted to celebrate this beautiful evening with the Club. Next to the great buffet, musical program has to be especially mentioned, which was sponsored by Axel Brauer. The Princess Band, consisting of three violinists, went first. Gentle sound of their violins enchanted the people, especially during anthem. Two French Shirley Ab (singer) and Marta Danny (guitar) surprised especially guests of French club Marina. Promised star of the evening was surely Barry Upton. He was in top form and presented the songs of our youth. 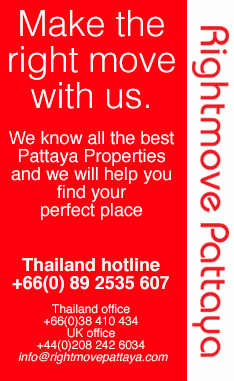 It didn´t take long and several guests shook a leg. Jan Abbink, Rodney Charman and Axel Brauer have not to be asked twice and jumped on stage to support Barry. At the end of the event there were only happy faces and all guests were thrilled by this amazing anniversary celebration.